The flatback derives its name from its flat oval carapace. The edge of this species shell are folded upward and covered with thin, waxy scutes. Flatbacks are olive-gray with pale brown with yellow tones underneath and flippers that are creamy white. This is the only species of sea turtle that does not migrate great distances. Their range is limited to the Pacific waters around Australia and Papua New Guinea. They prefer turbid inshore waters, bays, coastal reefs, and grassy shallows. Flatbacks nest four times per season every 16–17 days and lay only around 50 to 70 eggs at time. This species eggs and the subsequent hatchlings are quite large when compared to other species. The eggs incubate for 55 days and when the hatchlings emerge, they scurry to the sea like any turtle would. Juvenile flatbacks are thought to lack a pelagic (open ocean) existence, instead they remain in near shore waters with the adults. The flatbacks are protected by The Australian government. Small numbers of these turtles are still allowed to be taken for harvest by aboriginal tribes. 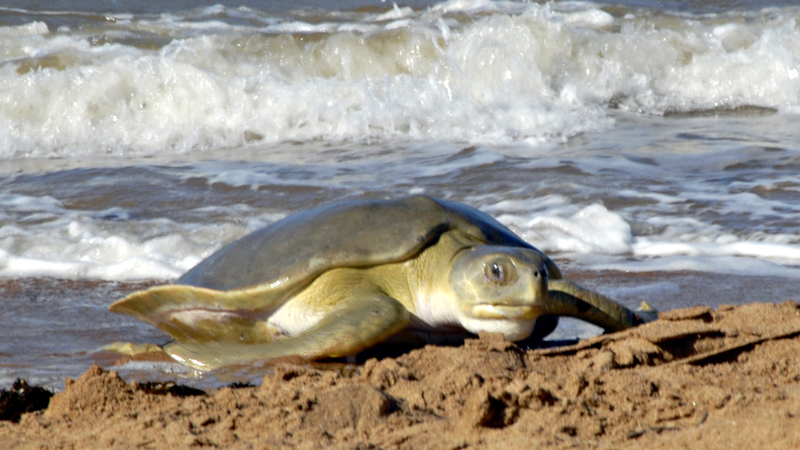 Threats facing these turtles include entanglement in prawn trawls and pollution in near shore environments where flatbacks feed and mate.